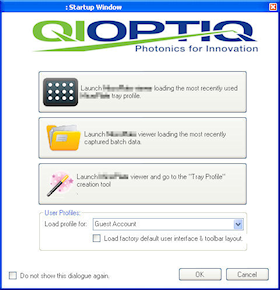 Qioptiq Ltd is a world-leading manufacturer of photonics and vision components. Within the UK, their activities focus on precision lenses and high-tech optics, primarily for the military and avionics sector. As a diversification, a project was undertaken to utilise Qioptiq UK’s optics and engineering expertise in a life-sciences (microscopy) market. A specialised microscopy unit was designed and built by one of their teams of design engineers - with a custom-designed stepper motor stage performing sample manipulation, and images being captured by a high-resolution industrial-grade digital camera. A prototype software application had been developed by a third party and the prototype unit had been subjected to a series of field trials. When the project was presented to WyeTec, the initial brief was to correct a few minor errors on, and add a few features to the prototype application, based on feedback from the field trials. During initial discussions, it soon became apparent that the prototype was not going to be suitable as the basis for a fully fledged and marketable product. A ground-up rewrite, incorporating as much code-reuse from the prototype application as possible, was deemed to be the best way to achieve the desired end result, and would also prove to be the most cost effective route. WyeTec’s familiarity with computer based imaging, coupled with expert knowledge of how to best integrate the user interface requirements, the back-end database, and the control of the stepper motor classes enabled us to deliver an end result that far exceeded the initial customer expectations in a timely and cost-effective manner. 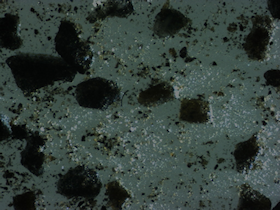 Fine particles of volcanic ash from the 2010 eruption of Eyjafjököll in Iceland that caused an extended period of air travel chaos. 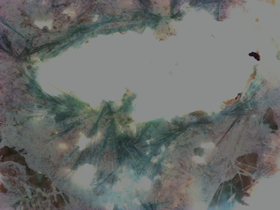 Crystal growth (magnified) captured on the microscopy unit using a colour, industrial-grade CCD camera. The application was written in Microsoft Visual Studio .Net, with a Microsoft SQL Server back-end database. 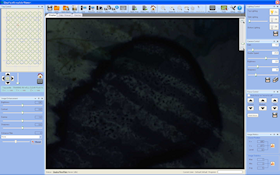 Image capture, processing and display were facilitated using a combination of the Matrox Imaging Library and proprietary code. The application was targeted on a Windows Embedded operating system, making the device a resilient dedicated microscopy unit. Contact WyeTec today to discuss your machine vision, imaging or embedded system project.